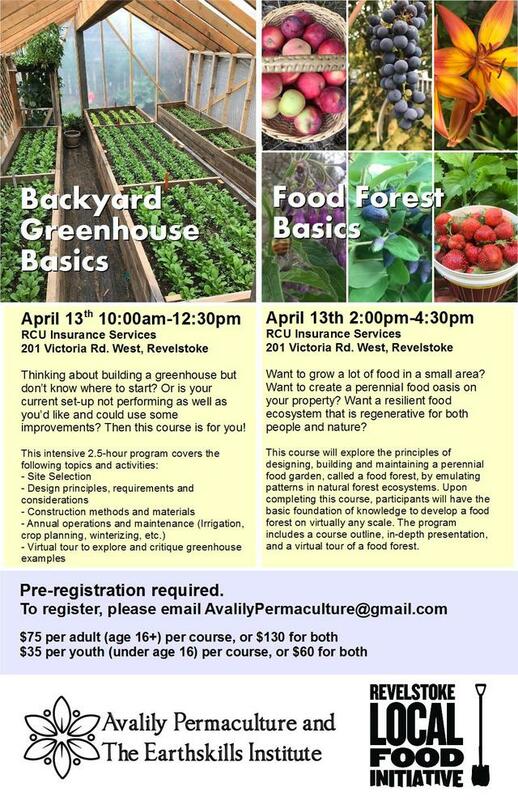 $75 per course or $130 for both with Avalily Permaculture and the Earthskills Institute from Invermere! Thinking about building a greenhouse but don’t know where to start? Or is your current set-up not performing as well as you’d like and could use some improvements? Then this course is for you! Want to grow a lot of food in a small area? Want to create a perennial food oasis on your property? Want a resilient food ecosystem that is regenerative for both people and nature? This course will explore the principles of designing, building and maintaining a perennial food garden, called a food forest, by emulating patterns in natural forest ecosystems. Upon completing this course, participants will have the basic foundation of knowledge to develop a food forest on virtually any scale. The program includes a course outline, in-depth presentation, and a virtual tour of a food forest.